Erkunden Sie Roms Museen, Architektur und Kunst mit dieser Hop-On-Hop-Off-Tour. Kaufen Sie ein Ticket und entdecken Sie die Reize der Stadt, während Sie in einem fröhlichen rosa Doppeldecker-Bus fahren. Schließen Sie die mitgelieferten Kopfhörer an und genießen Sie die aufgezeichneten Audiokommentare in 13 Sprachen für die 8 Haltestellen. Drucken und tauschen Sie Ihren Gutschein an Bord des Busses oder im Büro von Gray Line / I Love Rome. Bei allen Tickets (gleiche Gültigkeit) können Sie zu einem ermäßigten Preis profitieren. Alle Buslinien verfügen über eine Klimaanlage und kostenfreies WLAN. 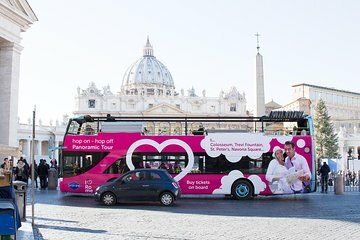 Panoramic Route (pinker Doppeldeckerbus): Neun Haltestellen an Roms Attraktionen, die man gesehen haben muss. Machen Sie Halt in Santa Maria Maggiore, dem Kolosseum, dem Circo Massimo, der Piazza Venezia, der Vatikanstadt und dem Castel Sant'Angelo. Um die informative Audiotour auf Italienisch, Englisch, Französisch, Deutsch, Spanisch, Japanisch, Chinesisch (Mandarin), Koreanisch, Russisch, Portugiesisch, Hindi, Arabisch und Niederländisch anzuhören, stehen individuelle Kopfhörer zur Verfügung. Diese Route verläuft alle 10 - 15 Minuten von 8.30 bis 18.40 Uhr von Montag bis Donnerstag. bis 20.45 Uhr von Freitag bis Sonntag. Vl haben wir Pech gehabt - es wurden nicht alle Stationen angefahren. Die Infos im Bus waren nicht berrauschend! I think we mostly enjoyed this, just for the easier transportation. The audio guide was ok, but boring. Go to the ACTUAL website of the company for the stop locations!! Trip advisor/viator gives you a receipt with instructions and stop locations, but those were not very accurate and caused us a large increase in the amount of walking we had to do to find a few of the stops. Great way to get around the city. Busses were everywhere, so we didn't have to wait long at all to jump on a bus at any given stop. We chose this tour over other HOHO tours because it offered many different options based on personal preferences. For example, we bought a ticket to use without disembarking, saving a lot of money. Also, we could validate our online-bought ticket on the bus itself and didn't have to go to the tour office. The tour was good the driver and host on board were polite. We did it on a Sunday, so it took us through Popolo Square instead of Via del Tritone Spanish Steps, Trevi Fountain. We did not get off the bus but used the 90-minute round trip to orient ourselves and get a feel of Rome. We also used it to get a birds eye view of places you don't plan to visit. We did, of course, look at the route map online before our purchase, because, while all HOHOs take you to the main sites, there are some tweaks based on their target audience. The ticket lady was not polite. She is not Italian. Very rude lady she is the one across the street from the Termini in Rome. Very rude lady. She was yelling at me. Not customer service oriented. Bad experience!!! Could hardly hear the intercom and there was little interst from staff, and only a few stops. Hadn't nbeen told Vatican not accessible for traffic. Worth the price but wear a coat at night. Nice to see everything without a lot of walking. The only issue we had was finding the bus stops as there are so many different bus companies. So look for the stop the day before if possible. Try to get the front seat too!